Quantum Therapy program presents detailed computerised version of the magnetic-infrared-laser (MIL) therapy guide and it contains all necessary reference information and explanations which can be used for patient's treatment with the help for apparatus MILTA, RIKTA and Vityaz families. Quantum Therapy program contains more than 150 authoring schemes of the Quantum medicine for treatment up to 200 different diseases using noninvasive, harmless, high efficient methods. The Program is designed for making up personalized treatment prescriptions considering all peculiarities of the patient`s current state of health. The Program is designed for use by the medical personnel of all specialties, different skill level and suits for a person with minimum computer erudition. 1. To find operatively recommended scheme of the Quantum medicine for each of the diseases presented in the Program reference directory. 2. To monitor this selected scheme day after day during the whole treatment course. 3. To develop a Combined (Integrated) method based on the selected therapy schemes (up to 5 schemes) using an optimizing algorithm. During the joining up the schemes user can indicate their priority (basic or an accompanying disease/pathology). It is possible to overlap several schemes on the known basic schemes вЂ“ Universal Rehabilitation Programs. Joining up the schemes into the personalized integrated method allows to activate tonus of immune system, harmonize metabolism and intensify blood circulation. When joining up the schemes user can set their priorities вЂ“ for main or accompanying disease. 4. To count automatically of the therapy allowed time, to provide the overlapping of treatment zones in different schemes, to control the incompatibility of zones and offer the optimum sequence (the order) of zones within the treatment procedure. 5. To display on PC screen the total data (frequency, intensity of therapy, time of influence), recommendations on a course length, measure of precaution, the remarks on combination of MIL-therapy with the other medical procedures. 6. A doctor (the Program user) can change with his/her own discretion the treatment parameters, add / remove treatment zones and also supply the prescription sheet with own comments. 7. The made-up method is kept in a database as a prescription sheet for quantum therapy and it also can be printed-out on a special physiotherapeutic form. 8. Functions of editing of the existing schemes and entering of new schemes for quantum therapy allow to greatly extend the bounds of all operating manuals issued earlier. 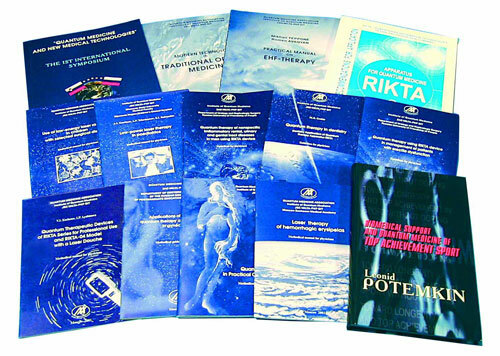 In cases, when the Program works within the ARM-PERESVET system it is necessary to perform computer express-diagnostics of the main systems of organism before the developing of a MIL-therapy prescription. In these circumstances a patient obtains strictly personalized integrated method of the quantum therapy that is based on a pathology that has been detected during diagnostic session. The express-diagnostics methods allow also monitoring of the vitally important systems current states during all stages of treatment. Thus, the high-quality selection of the most effective schemes of the MIL-impact on the man`s organism is provided. Doctor has an opportunity to combine within the ARM-PERESVET system the MIL-therapy with homeopathy, naturotherapy and electro stimulating reflexotherapy to gain synergetic effect of different treatment methods.